My grandma has had Giants season tickets for as long as I can remember, and she always made sure that each person in the family got a chance to see a game…I was lucky enough to receive the World Series tickets with my father. I was 22 at the time. We started our journey in Mendocino County that day, stopping in Sonoma County to pick up a couple deli sandwiches and some spirit-like refreshments. We arrived at Candlestick, parked the truck and had a nice tailgate. As I drank my tall can of Sapporo and looked around at the festivities, one thing caught my interest: some of the banners and flags that were tangled in the light towers above the stadium. And there was a person climbing up one of the towers to untangle those banners. After our tailgate picnic and drinks, we filed into the stadium and found our seats. Once we were in our seats we were getting ready for the game: the stadium was packed and the crowd was ready for baseball. 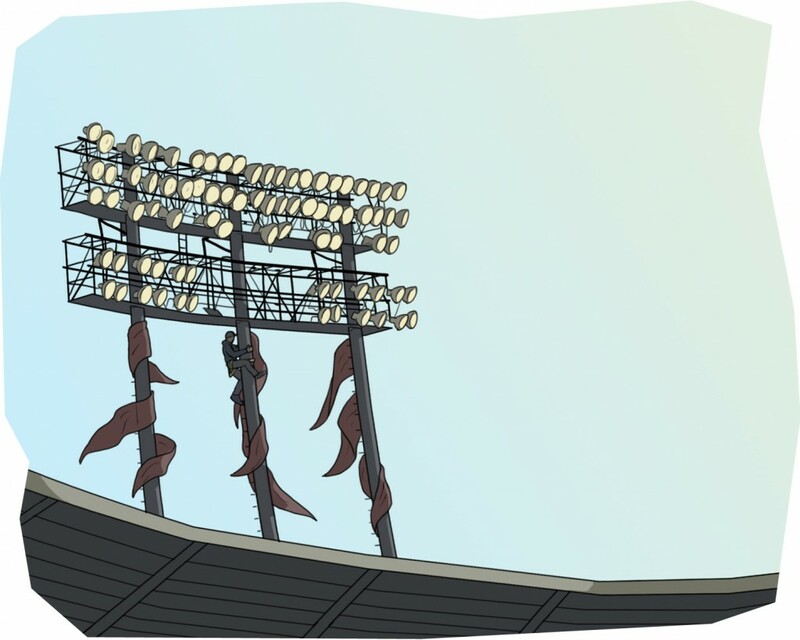 It was then that I heard the covers around the stadium lights start to bang loudly into each other, making a clanging sound. Seconds later we were riding our stadium seats while a very intense earthquake moved through. I felt a sharp pain in my shoulders and neck, and when I turned and looked, the lady behind me was digging her fingernails into my shoulders, screaming and crying: I felt bad for her and I wasn’t sure how to ask her to stop. I then remembered the guy that had been climbing the light tower earlier; I looked over at that light tower to see him clinging to it for dear life as it was swinging. It seemed like it lasted forever, but I am sure it was a very short time. It was surreal: time seemed to slow down and almost stand still. Of course, I saw the players moving around the field with their families. I was jealous– I wanted to be on the ground, not in the upper deck! Post-earthquake, my dad and some others started to chant, “Let’s play ball, let’s play ball!” We really didn’t know how serious the quake was until we started hearing reports from a transistor radio of a neighboring fan. It was then we realized that not only would we not be watching baseball but that we also didn’t know how we would get home. We had heard the Bay Bridge and the Cypress Structure had collapsed and that there were large fires in the city. Our first thought was that we would go to some of our extended family that lived in the Santa Cruz Mountains. Once we got out to the truck and continued to listen to the radio, we heard that the Golden Gate Bridge was still open so we decided we would try and go home to Mendocino County before it was potentially closed. While we were stuck in traffic in SF, working our way through the Hunters Point and the Bay View District, we watched groups of young people breaking windows and beginning to loot some of the stores. One of the looters spotted us in my truck, and yelled to his friends that he had found a pickup truck for them to use. I pulled my truck out of traffic, up on to the sidewalk, and drove out of there as fast as I could. I don’t remember stopping until Marin County.